A Disney KEEP Collective Holiday Party! 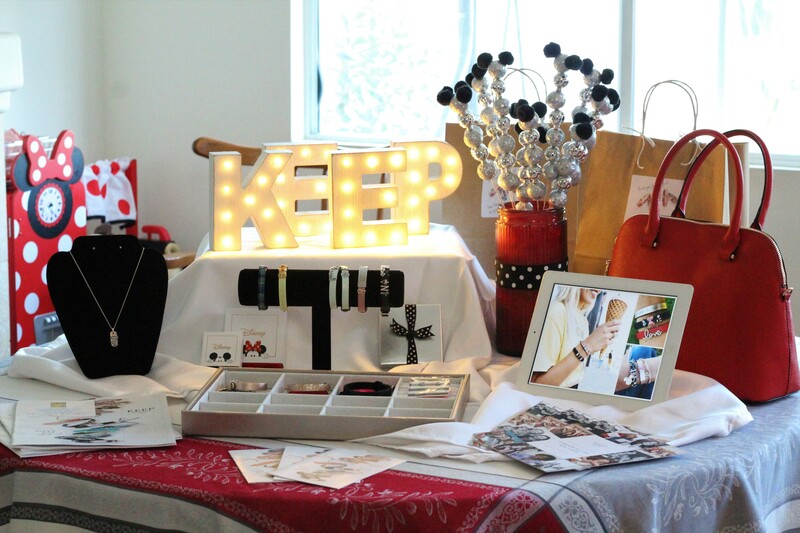 Up until a couple of months ago, I had never heard of KEEP Collective, a brand of personalized necklaces, bracelets, etc that you add charms to to personalize. I first heard about KEEP when they announced they would be having a Disney collection! Of course, anything Disney always gets my attention. Once I heard about the collection and got my first set of Disney KEEP charms (which I had personalized for my blog), I started becoming addicted to mixing and matching KEEP bracelets! To celebrate Mickey’s recent birthday, I co-hosted a KEEP Collective party with my friend and KEEP Collective designer Melanie (You can find her page here). We set up lots of food, including a veggie and hummus Mickey shaped plate, vegan peppermint brownies, and my Vandor Inc Mickey and Minnie plates. Our guests and us played around with Melanie’s selection of bracelets and charms. Having good conversation, sipping wine, and playing around with jewelry made for quite a fun evening! Even the boxes for the Disney charms are cute! I particularly had fun playing around with the palm tree charms and Disney charms, to give me ideas of fun bracelets I could wear on my Disney Cruise next year! It was such a fun evening for my friends and I who are fashionistas, so was so excited to share my fun KEEP party experience with all of you! I love that they have a wide variety of Disney charms and charms in other genres, so you can really make jewelry to reflect any hobby, life event, etc. If you want to browse from my KEEP designer Melanie’s page (she’s the best, never pushy, and great at giving design suggestions), you can find here page here. Playing around with Melanie’s collection of KEEP charms and bracelets. Browsing the KEEP Collective selection through catalogs and online!